Learning how to shoot a basketball jump shot is a must if you want to become a more versatile scorer. The jumper builds upon the basics of a set shot with some key changes. 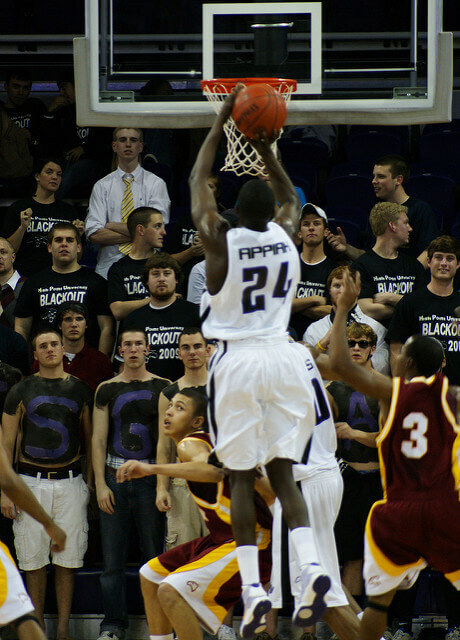 While a set shot is taken from a stationary position requiring the shooter to be wide open, the jump shot allows players to score on the move, in traffic, and by jumping up above their defender. It opens up more shooting opportunities, and it's a difficult shot to defend. That being said, there aren't many youth basketball players who can shoot a jumper. For starters, it requires a lot of physical strength. More than most young players have. They attempt skills like shooting from 3-point range or shooting a jumper before they have the strength required to shoot the ball properly. Don't sacrifice proper form by starting too early. The best thing a player can do is develop the basic mechanics of a set shot. Then, as strength increases and with a couple key adjustments, players will be ready to add a basketball jump shot to their scoring arsenal. When shooting a set shot, the ball rests under your shooting eye. You look at the basket over the top of the ball. For a jump shot, pull the ball up quickly to your forehead above your shooting eye. Look under the ball to your target. Get the ball in the proper shooting position as quickly as possible by bringing the ball straight up past the face. The shooting elbow should be in line with the shooting knee and foot. Your shooting forearm should be at a 90-degree angle to the floor, and your upper arm should be at least parallel to the floor. Get the shooting wrist "locked and loaded." The back of the shooting hand should be parallel to the floor with the wrist cocked so you can see the wrinkles at your wrist. When shooting a set shot, your shot release is timed to happen at the same time you fully extend your legs. For a basketball jump shot, shoot the ball after you jump. The ball should be released near the top of the jump as the ankles, legs, hips, and shoulders fully extend. The elbow should be fully extended and the ball should roll off of the index and middle fingers as the wrist snaps. Rhythm - The key to shooting jump shots well is a smooth shooting rhythm. The rhythm begins with the feet and ends with the fingertips during the follow-through. Force - The force produced by your legs during your jump establishes your shooting rhythm. You need a quick, strong push upward from the ground. Bend your knees and explode up off of your toes. The strength of your push off will determine your shooting range. Direction - It's important to jump straight up and not off to the side or forward or backward. For the ball to travel in a straight line to your target, your body must be aligned and moving in a vertical direction. Your take off and your landing should be in the same spot. Height - The height of your jump will depend on the length of the shot. The farther away you are, the more energy you will need to generate from your legs. If you are closely guarded, you'll need to jump higher to rise above your defender and shoot the ball at the peak of your jump. Timing - If you release the ball too early (on the way up), there's a tendency to push the ball and shoot it with too much force. If you release the ball too late (hang in the air too long), the ball will fall short of the goal. The ball should be released just before the peak of the jump to take maximum advantage of the power coming from your legs. Jump shots are just one type of shot basketball players need to learn. 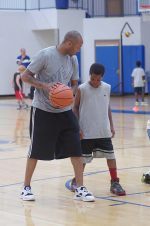 Learn how to shoot a basketball lay-up and free throw.